Our Easter weekend meanderings was a fascinating example of the best of shop culture that I’ve found in Britain and not found anywhere else. America might be run by consumer culture, but I’ve never lived anywhere that does shops like I’ve found here. On the other hand, I shouldn’t be surprised, Britain has been built on shopkeepers and mercantilism for centuries. But in an age of brand shopping, fast fashion, ready made everything, and general convenience being king, it’s kind of great to see how personal business can be. 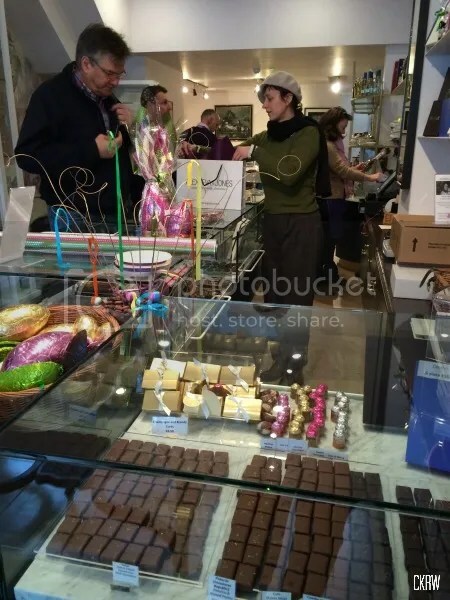 Our first stop of the day was Alexeeva and Jones, to pick up some Easter chocolate. We got to chatting with the woman assisting us, and it turns out that she was one of the founders! I expressed how much I enjoy the fun and unusual chocolates they carry and she immediately asked if I was a repeat customer, and had I been given a discount? Yes, and no respectively. She immediately whipped out her business card and wrote us a personal 10% coupon, no expiry date. 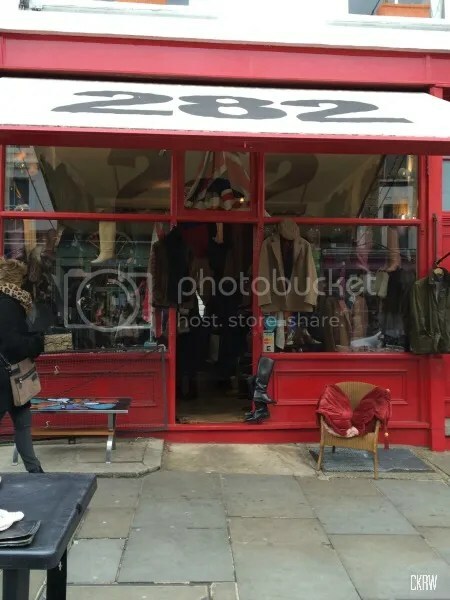 Feeling pretty pleased, we headed up to 282 Portobello Road. I have been on the hunt for a tweed jacket for months and to be frank, most off the rack stuff doesn’t fit me. I’m a petite woman with a short waist, and a definite hourglass figure, but broad ribs. It’s a tricky business finding me any clothing that fits correctly–believe in tailoring, kittens–and I’ve not had a lot of luck with jackets in general. As far as I’m concerned, if you’re looking for vintage clothing that focuses on classic British houses, cuts, and tailoring, Claudia is the woman you need to see. I’ve written of my unabashed enthusiasm for her before, but life and work have been so busy for months now and I haven’t had the time to visit old favorite haunts. Well, after months of looking in all the wrong places, I walked into 282, and found a 1950s jacket almost immediately that looked like it was cut to my exact frame. The sleeve length, the lapels, the fit…it’s perfect. As she was ringing us up, Claudia glanced over at us and declared, “You guys have been here before.” We had, but as a mentioned, it hadn’t been in months. I said as much but she just beamed, “I love it when people come back and find something they love.” And she gave me an instant price reduction. 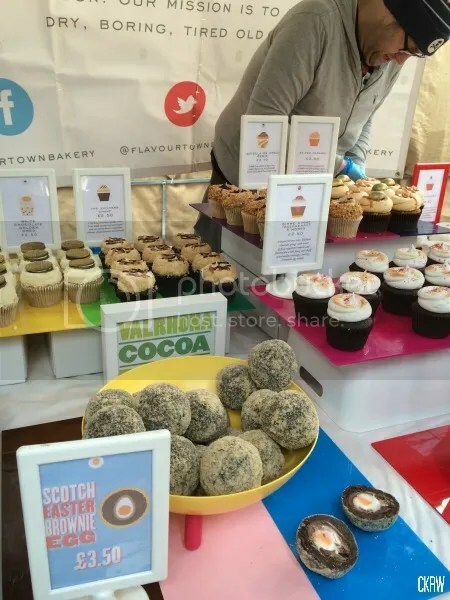 Finally, on Sunday we went to Spitalfields to get a “scotch egg brownie” from Flavourtown Bakery–maker of the finest cupcakes in the city, as determined by SDS Industries. We hang out at Spitalfields regularly on the weekends and have been buying treats from Flavourtown for months. The owner recognizes us, knows our favorites, and makes recommendations. That day was no different except that we had a long chat about how they’ve started supplying two of the most famous department store foodhalls in the city, how one of their lead team members had to leave due to family reasons, and the general ups and downs they’ve experienced. In the end, we bought a box of cupcakes (along with some helpful tips on how best to freeze them so as not to glut ourselves on sugar), and got the last “secret” flavor of the week cupcake thrown in. Pro tip, like them on Facebook, fans get extra treats. In rapid succession, I saw how personal relationships build business. As someone who has (believe it or not, based on this post) tried to cut down on a lot of unneeded consumerism in her life, it was an insightful weekend. A woman learned I valued her product and immediately provided me a way to enjoy it more, benefiting us both. Another woman recognized me as a repeat customer who expresses enthusiasm for what she’s enthusiastic about, and helped me get something I’ve wanted for months for just a little bit less. I know I’ll be back to buy from her again, and it has nothing to do with the discount. And finally, a guy who probably enables my sweet tooth too much, and who has countless of customers across multiple markets and shops, takes time to recognize his regulars and engage with them genuinely. As a result, we make it a point to keep coming back to say hi and see how he’s doing. We inevitably come away with a treat. It’s not just these guys either! Now that the weather is warming up, I’m shopping at markets again and I get recognized by produce stand owners, cheesemongers, and breadmakers. I’ve asked shopkeepers for advice from cloth to cuts of meat and gotten minor educations. I don’t know if it’s the tradition, the relative small size of the country, or just something in the culture, but the British do shops far better than anywhere I’ve lived, and they seem to do a better job about sustaining them as well. It is possible to build a business out of something someone is desperately passionate about here in a way I’ve not found in a lot of other places. I hope I never have to give them up.